What happens when two of the best ancient cuisines meet, Lebanese and Persian? It’s simply a queen’s feast! Shayan Restaurant is one out of three restaurants at Al Ghurair Rayhaan by Rotana. I am 100% sure you are familiar with the symbol ‘R’ and Rotana has more than 30 hotels in the UAE itself. As a foodie, ambience has slowly become a very important part of my review (food is more important) and Shayans ambience and modern interior details are beautiful and live OUD music added more of a traditional touch! Not to forget, the spinning table is the new cool. A perfect place for family gatherings. 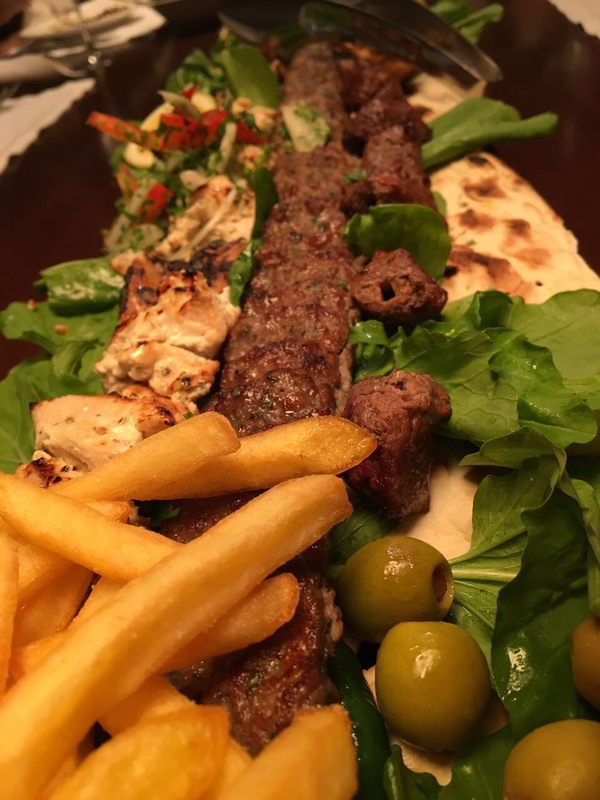 It was the launch of Lebanese menu and we were promised to be served the best of the Middle Eastern dishes such as mezze, grilled kebabs and much more! A hearty lentil soup with exotic turmeric and earthy cumin flavors. Simply healthy and comforting. It was made of eggplant blended with finely diced onions and tomatoes. Rich and smoky with creamy texture making it an ultimate dip with Khabus and to the fav dips list. To be honest, I have never liked hummus so it would be wrong to judge but everyone at the table seemed to like it! Perfect food finger spinachstuffed traingle shaped pastry. Was it the right chew, flavor and colour? Yes, it was! Flaky dough filled with cheese treat. The cheese was a little dry for my likings but I had more than one. A mixture of feta and mozzarella cheese. These treats were crispy but the cheese filling was too dry. Tender, fresh and juicy meat that was slightly pink which is a good sign. A little bit of spicy would have been nice. These authentic lamb Kebabs are just how kebabs should be – fresh and full of flavour! Must have! Grilled chicken breast with common flavors of garlic and lemon being in the Lebanese-style with delicious flavourings but more spices were needed. 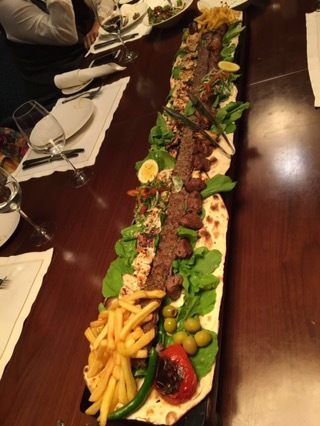 To clear, there is nothing fancy about the kebab. 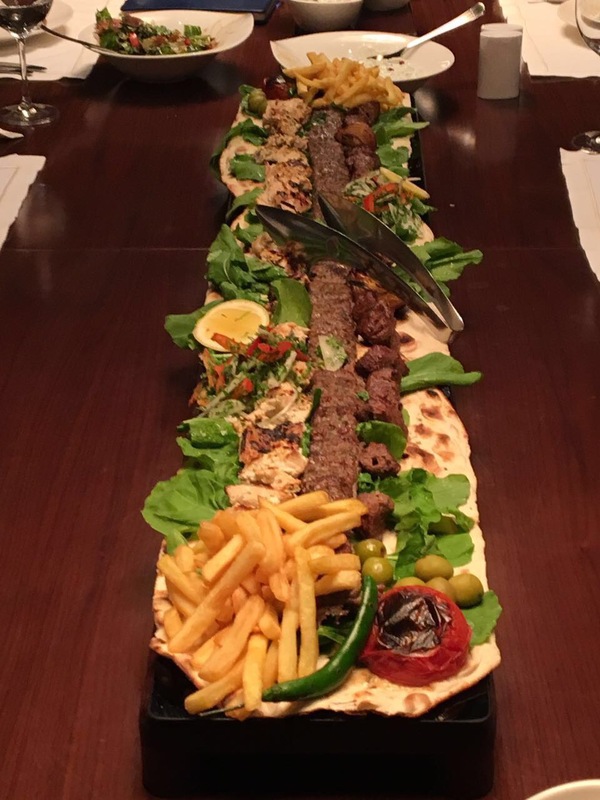 It is basically a 1 meter long kebab sharing platter, with three types of Kebab served along with salad, olives, frenchfries and pieces of chicken kebab. All were, tasty, tender and full of flavour! Definitely worth it and best for a group of 10-11 persons. Lebanese mix platter included variety of sweets including Katayef, Muhallabieh, Nummoora and etc.. Among all Baklawa was my favourite as for the crispy, flaky and nutty slice of goodness and I love that it wasn’t overly sweet. Overall, it was a successful discovery as for the ancient cuisines with beautiful settings. Thank you Al Ghurair Rotana (Ferry) for having me at the bloggers event and for all the delicious food.